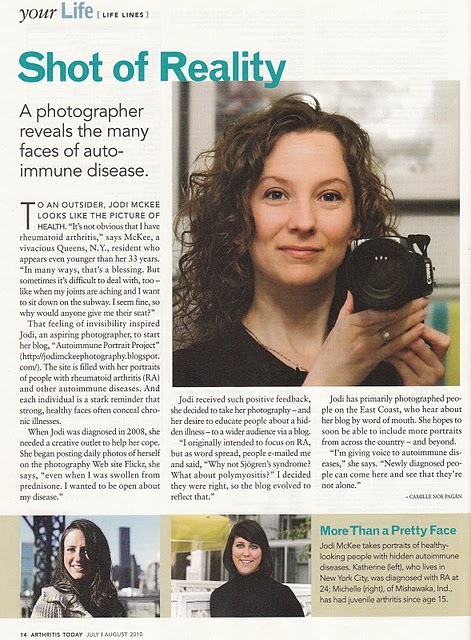 A big thank you to Arthritis Today magazine for profiling me and my portrait project in the July/August issue! I am absolutely thrilled. Welcome to all of you who are finding me through this article. I am always on the look out for new subjects to photograph, so please e-mail me at jodimckeephotography@gmail.com if you are interested in participating! Also, thanks to Kat and Michelle for posing for portraits last winter and waiting until now to see them online. I will be posting their profiles over the coming weeks. Thank you all so much for your support. It means the world to me.